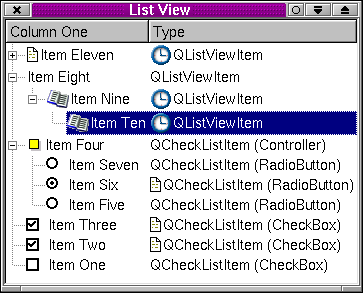 The QListViewItem class implements a list view item. A list view item is a multi-column object capable of displaying itself in a QListView. The easiest way to use QListViewItem is to construct one with a few constant strings, and either a QListView or another QListViewItem as parent. We've discarded the pointers to the items since we can still access them via their parent listView. By default, QListView sorts its items; this can be switched off with QListView::setSorting(-1). The parent must be another QListViewItem or a QListView. If the parent is a QListView, the item becomes a top-level item within that QListView. If the parent is another QListViewItem, the item becomes a child of that list view item. If you keep the pointer, you can set or change the texts using setText(), add pixmaps using setPixmap(), change its mode using setSelectable(), setSelected(), setOpen() and setExpandable(). You'll also be able to change its height using setHeight(), and traverse its sub-items. You don't have to keep the pointer since you can get a pointer to any QListViewItem in a QListView using QListView::selectedItem(), QListView::currentItem(), QListView::firstChild(), QListView::lastItem() and QListView::findItem(). If you call delete on a list view item, it will be deleted as expected, and as usual for QObjects, if it has any child items (to any depth), all these will be deleted too. QCheckListItems are list view items that have a checkbox or radio button and can be used in place of plain QListViewItems. You can traverse the tree as if it were a doubly-linked list using itemAbove() and itemBelow(); they return pointers to the items directly above and below this item on the screen (even if none of them are actually visible at the moment). Note that the order of the children will change when the sorting order changes and is undefined if the items are not visible. You can, however, call enforceSortOrder() at any time; QListView will always call it before it needs to show an item. text() Returns the text in a column. Many subclasses will compute this on the fly. key() Used for sorting. The default key() simply calls text(), but judicious use of key() can give you fine control over sorting; for example, QFileDialog reimplements key() to sort by date. setup() Called before showing the item and whenever the list view's font changes, for example. activate() Called whenever the user clicks on the item or presses Space when the item is the current item. Some subclasses call setExpandable(TRUE) even when they have no children, and populate themselves when setup() or setOpen(TRUE) is called. The dirview/dirview.cpp example program uses this technique to start up quickly: The files and subdirectories in a directory aren't inserted into the tree until they're actually needed. See also QCheckListItem, QListView, and Advanced Widgets. Constructs a new top-level list view item in the QListView parent. Constructs a new list view item that is a child of parent and first in the parent's list of children. Constructs an empty list view item that is a child of parent and is after item after in the parent's list of children. Since parent is a QListView the item will be a top-level item. Constructs an empty list view item that is a child of parent and is after item after in the parent's list of children. Constructs a new top-level list view item in the QListView parent, with up to eight constant strings, label1, label2, label3, label4, label5, label6, label7 and label8 defining its columns' contents. Constructs a new list view item as a child of the QListViewItem parent with up to eight constant strings, label1, label2, label3, label4, label5, label6, label7 and label8 as columns' contents. Constructs a new list view item in the QListView parent that is included after item after and that has up to eight column texts, label1, label2, label3, label4, label5, label6, label7 andlabel8. Note that the order is changed according to QListViewItem::key() unless the list view's sorting is disabled using QListView::setSorting(-1). Constructs a new list view item as a child of the QListViewItem parent. It is inserted after item after and may contain up to eight strings, label1, label2, label3, label4, label5, label6, label7 and label8 as column entries. Destroys the item, deleting all its children and freeing up all allocated resources. Returns TRUE if the item can accept drops of type QMimeSource mime; otherwise returns FALSE. The default implementation does nothing and returns FALSE. A subclass must reimplement this to accept drops. This virtual function is called whenever the user presses the mouse on this item or presses Space on it. When called from a reimplementation of activate(), this function gives information on how the item was activated. Otherwise the behavior is undefined. If activate() was caused by a mouse press, the function sets pos to where the user clicked and returns TRUE; otherwise it returns FALSE and does not change pos. pos is relative to the top-left corner of this item. Warning: We recommend that you ignore this function; it is scheduled to become obsolete. This function is called if the user cancels in-place renaming of this item in column col (e.g. by pressing Esc). Returns how many children this item has. The count only includes the item's immediate children. Compares this list view item to i using the column col in ascending order. Returns < 0 if this item is less than i, 0 if they are equal and > 0 if this item is greater than i. This function is used for sorting. We don't recommend using ascending so your code can safely ignore it. Returns the depth of this item. Returns TRUE if this item can be dragged; otherwise returns FALSE. The default implementation does nothing, subclasses may need to reimplement this function. Returns TRUE if this item accepts drops; otherwise returns FALSE. See also setDropEnabled() and acceptDrop(). This function is called when something was dropped on the item. e contains all the information about the drop. Makes sure that this object's children are sorted appropriately. This only works if every item from the root item down to this item is already sorted. Returns the first (top) child of this item, or 0 if this item has no children. Note that the children are not guaranteed to be sorted properly. QListView and QListViewItem try to postpone or avoid sorting to the greatest degree possible, in order to keep the user interface snappy. See also nextSibling() and sortChildItems(). Returns the height of this item in pixels. This does not include the height of any children; totalHeight() returns that. Inserts newChild into this list view item's list of children. You should not need to call this function; it is called automatically by the constructor of newChild. Warning: If you are using Single selection mode, then you should only insert unselected items. Invalidates the cached total height of this item, including all open children. See also setHeight(), height(), and totalHeight(). Returns TRUE if this item is enabled; otherwise returns FALSE. Returns TRUE if this item is expandable even when it has no children; otherwise returns FALSE. Returns TRUE if this item is selected; otherwise returns FALSE. See also setSelected(), QListView::setSelected(), and QListView::selectionChanged(). Returns TRUE if the item is visible; otherwise returns FALSE. Returns a pointer to the item immediately above this item on the screen. This is usually the item's closest older sibling, but it may also be its parent or its next older sibling's youngest child, or something else if anyoftheabove->height() returns 0. Returns 0 if there is no item immediately above this item. This function assumes that all parents of this item are open (i.e. that this item is visible, or can be made visible by scrolling). This function might be relatively slow because of the tree traversions needed to find the correct item. See also itemBelow() and QListView::itemRect(). Returns a pointer to the item immediately below this item on the screen. This is usually the item's eldest child, but it may also be its next younger sibling, its parent's next younger sibling, grandparent's, etc., or something else if anyoftheabove->height() returns 0. Returns 0 if there is no item immediately below this item. This function assumes that all parents of this item are open (i.e. that this item is visible or can be made visible by scrolling). See also itemAbove() and QListView::itemRect(). Returns the y coordinate of this item in the list view's coordinate system. This function is normally much slower than QListView::itemAt(), but it works for all items whereas QListView::itemAt() normally only works for items on the screen. See also QListView::itemAt(), QListView::itemRect(), and QListView::itemPos(). Returns a key that can be used for sorting by column column. The default implementation returns text(). Derived classes may also incorporate the order indicated by ascending into this key, although this is not recommended. If you want to sort on non-alphabetical data, e.g. dates, numbers, etc., it is more efficient to reimplement compare(). See also compare() and sortChildItems(). Returns a pointer to the list view containing this item. Move the item to be after item after, which must be one of the item's siblings. To move an item in the hierarchy, use takeItem() and insertItem(). Note that this function will have no effect if sorting is enabled in the list view. Returns TRUE if the item can display multiple lines of text in its columns; otherwise returns FALSE. Returns the sibling item below this item, or 0 if there is no sibling item after this item. Note that the siblings are not guaranteed to be sorted properly. QListView and QListViewItem try to postpone or avoid sorting to the greatest degree possible, in order to keep the user interface snappy. See also firstChild() and sortChildItems(). This function is called if the user presses Enter during in-place renaming of the item in column col.
Paints a set of branches from this item to (some of) its children. Painter p is set up with clipping and translation so that you can only draw in the rectangle that needs redrawing; cg is the color group to use; the update rectangle is at (0, 0) and has size width w by height h. The top of the rectangle you own is at y (which is never greater than 0 but can be outside the window system's allowed coordinate range). The update rectangle is in an undefined state when this function is called; this function must draw on all of the pixels. See also paintCell() and QListView::drawContentsOffset(). This virtual function paints the contents of one column of an item and aligns it as described by align. p is a QPainter open on the relevant paint device. p is translated so (0, 0) is the top-left pixel in the cell and width-1, height()-1 is the bottom-right pixel in the cell. The other properties of p (pen, brush, etc) are undefined. cg is the color group to use. column is the logical column number within the item that is to be painted; 0 is the column which may contain a tree. This function may use QListView::itemMargin() for readability spacing on the left and right sides of data such as text, and should honor isSelected() and QListView::allColumnsShowFocus(). If you reimplement this function, you should also reimplement width(). The rectangle to be painted is in an undefined state when this function is called, so you must draw on all the pixels. The painter p has the right font on entry. See also paintBranches() and QListView::drawContentsOffset(). Paints a focus indicator on the rectangle r using painter p and colors cg. See also paintCell(), paintBranches(), and QListView::allColumnsShowFocus. Returns the parent of this item, or 0 if this item has no parent. See also firstChild() and nextSibling(). Returns the pixmap for column, or 0 if there is no pixmap for column. See also setText() and setPixmap(). This function has been renamed takeItem(). Returns TRUE if this item can be in-place renamed in column col; otherwise returns FALSE. Repaints this item on the screen if it is currently visible. Make your derived classes return their own values for rtti(), so that you can distinguish between different kinds of list view items. You should use values greater than 1000 to allow for extensions to this class. If allow is TRUE, the list view starts a drag (see QListView::dragObject()) when the user presses and moves the mouse on this item. If allow is TRUE, the list view accepts drops onto the item; otherwise drops are not allowed. If b is TRUE the item is enabled; otherwise it is disabled. Disabled items are drawn differently (e.g. grayed-out) and are not accessible by the user. Sets this item to be expandable even if it has no children if enable is TRUE, and to be expandable only if it has children if enable is FALSE (the default). The dirview example uses this in the canonical fashion. It checks whether the directory is empty in setup() and calls setExpandable(TRUE) if not; in setOpen() it reads the contents of the directory and inserts items accordingly. This strategy means that dirview can display the entire file system without reading very much at startup. Note that root items are not expandable by the user unless QListView::setRootIsDecorated() is set to TRUE. Sets this item's height to height pixels. This implicitly changes totalHeight(), too. Note that a font change causes this height to be overwritten unless you reimplement setup(). For best results in Windows style we suggest using an even number of pixels. See also height(), totalHeight(), and isOpen(). If b is TRUE each of the item's columns may contain multiple lines of text; otherwise each of them may only contain a single line. Opens or closes an item, i.e. shows or hides an item's children. If o is TRUE all child items are shown initially. The user can hide them by clicking the - icon to the left of the item. If o is FALSE, the children of this item are initially hidden. The user can show them by clicking the + icon to the left of the item. Examples: checklists/checklists.cpp, dirview/dirview.cpp, dirview/main.cpp, fileiconview/mainwindow.cpp, and xml/tagreader-with-features/structureparser.cpp. Sets the pixmap in column column to pm, if pm is non-null and different from the current pixmap, and if column is non-negative. See also pixmap() and setText(). If b is TRUE, this item can be in-place renamed in the column col by the user; otherwise it cannot be renamed in-place. Sets this items to be selectable if enable is TRUE (the default) or not to be selectable if enable is FALSE. The user is not able to select a non-selectable item using either the keyboard or the mouse. The application programmer still can though, e.g. using setSelected(). If s is TRUE this item is selected; otherwise it is deselected. This function does not maintain any invariants or repaint anything -- QListView::setSelected() does that. See also height() and totalHeight(). Sets the text in column column to text, if column is a valid column number and text is different from the existing text. If text() has been reimplemented, this function may be a no-op. See also text() and key(). Examples: addressbook/centralwidget.cpp, qutlook/centralwidget.cpp, and xml/outliner/outlinetree.cpp. If b is TRUE, the item is made visible; otherwise it is hidden. If the item is not visible, itemAbove() and itemBelow() will never return this item, although you still can reach it by using e.g. QListViewItemIterator. This virtual function is called before the first time QListView needs to know the height or any other graphical attribute of this object, and whenever the font, GUI style, or colors of the list view change. Sorts all this item's child items using the current sorting configuration (sort column and direction). Sorts this item's children using column column. This is done in ascending order if ascending is TRUE and in descending order if ascending is FALSE. See also key() and compare(). If in-place renaming of this item is enabled (see renameEnabled()), this function starts renaming the item in column col, by creating and initializing an edit box. Removes item from this object's list of children and causes an update of the screen display. The item is not deleted. You should not normally need to call this function because QListViewItem::~QListViewItem() calls it. The normal way to delete an item is to use delete. If you need to move an item from one place in the hierarchy to another you can use takeItem() to remove the item from the list view and then insertItem() to put the item back in its new position. If a taken item is part of a selection in Single selection mode, it is unselected and selectionChanged() is emitted. If a taken item is part of a selection in Multi or Extended selection mode, it remains selected. Warning: This function leaves item and its children in a state where most member functions are unsafe. Only a few functions work correctly on an item in this state, most notably insertItem(). The functions that work on taken items are explicitly documented as such. Returns the text in column column, or QString::null if there is no text in that column. See also key() and paintCell(). Examples: addressbook/centralwidget.cpp, dirview/dirview.cpp, network/archivesearch/archivedialog.ui.h, and network/ftpclient/ftpmainwindow.ui.h. Returns the total height of this object, including any visible children. This height is recomputed lazily and cached for as long as possible. Functions which can affect the total height are, setHeight() which is used to set an item's height, setOpen() to show or hide an item's children, and invalidateHeight() to invalidate the cached height. Returns the number of pixels of width required to draw column c of list view lv, using the metrics fm without cropping. The list view containing this item may use this information depending on the QListView::WidthMode settings for the column. The default implementation returns the width of the bounding rectangle of the text of column c.
See also listView(), widthChanged(), QListView::setColumnWidthMode(), and QListView::itemMargin. Call this function when the value of width() may have changed for column c. Normally, you should call this if text(c) changes. Passing -1 for c indicates that all columns may have changed. It is more efficient to pass -1 if two or more columns have changed than to call widthChanged() separately for each one.